NETWORK FINALS: CANDY CRUSH, the US AMATEUR GOLF CHAMPIONSHIP, the 8:30PM rerun of FAMILY GUY, the 9PM rerun of THE SIMPSONS, and the rerun of AMERICA’S FUNNIEST HOMEVIDEOS dropped 0.1 in final numbers. CABLE HIGHLIGHTS: The season premiere of Starz’s SURVIVOR’S REMORSE was dead even with the 2016 premiere at 0.41, airing after a POWER episode that was up 0.07 to 0.85. On TNT, THE LAST SHIP returned at 0.34/0.30, which compares to last season’s 0.41/0.39 (but that premiere aired against the NBA Finals; Week 2 was at 0.57). Things didn’t get prettier at Showtime, where the final season of EPISODES premiered at 0.05/239K (the 2015 premiere was 0.17), and DICE returned at 0.03/177K (0.11 in 2016), after TWIN PEAKS rose 0.04 to 0.10, and RAY DONOVAN was down 0.02 to 0.27. There was no suspense about the winner of Sunday cable, as HBO’s GAME OF THRONES declined 0.27 to 4.71, after which BALLERS lost 0.13 to 1.08, INSECURE held at 0.66, and LAST WEEK TONIGHT fell 0.15 to 0.67. On Adult Swim, RICK & MORTY slipped 0.11 to 1.26, and DECKER: MINDWIPE was down 0.04 to 0.44. FX’s THE STRAIN fell 0.05 to 0.31. Hallmark’s CHESAPEAKE SHORES ticked up to 0.22. MTV’s TEEN WOLF aired 2 episodes at 0.22/0.17, compared to last week’s 0.21. Unscripted was led by NFL Network’s Preseason game at 0.66. On TLC, 90 DAY FIANCE aired 2 hours at 0.65/0.59, compared to 0.49 last week, and SPOUSE HOUSE was up 0.08 to 0.31. Discovery’s NAKED & AFRAID ticked up to 0.47. ESPN’s MLB SUNDAY NIGHT game was at 0.45. 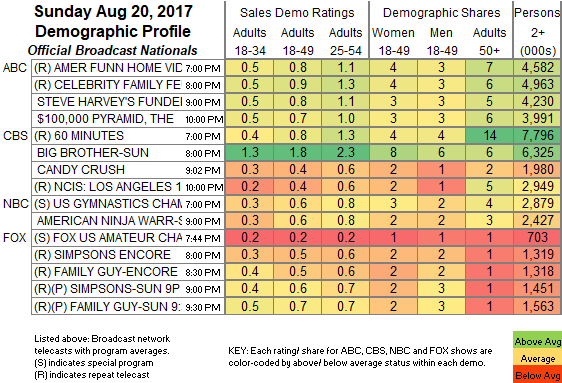 On Bravo, SHAHS OF SUNSET ticked up to 0.43. HGTV’s busy line-up was led by CARIBBEAN LIFE at 0.38/0.36, compared to last week’s 0.42/0.39. On E!, a REUNION ROAD TRIP special was at 0.38, LIFE OF KYLIE fell 0.09 to 0.35, and WAGS returned at 0.26. 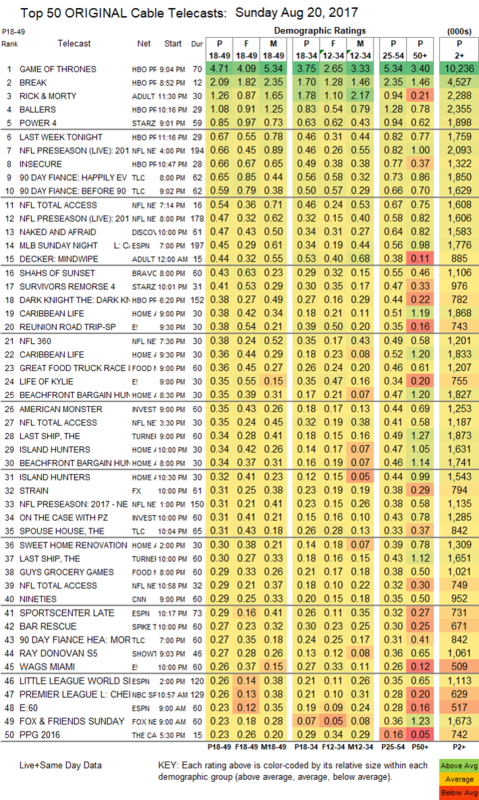 On Food Network, GREAT FOOD TRUCK RACE was at 0.36, and GUY’S GROCERY GAMES ticked down to 0.29. On ID, AMERICAN MONSTER gained 0.06 to 0.35, and ON THE CASE ticked up to 0.31. Spike’s BAR RESCUE lost 0.03 to 0.27.